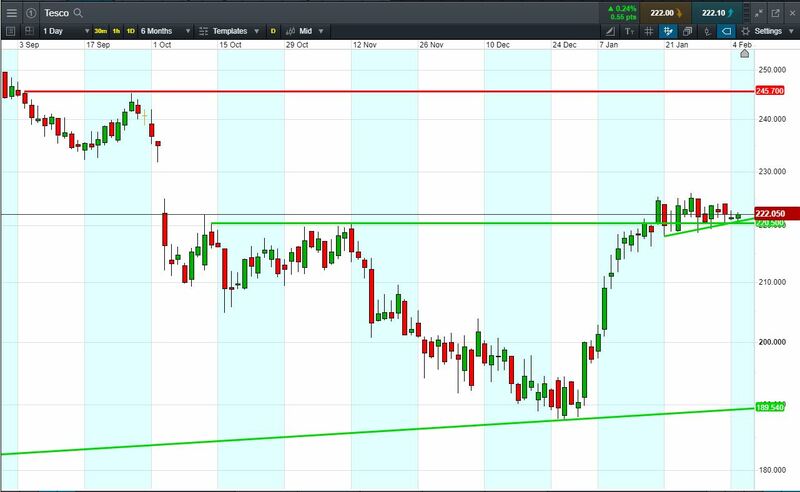 Will Tesco break support, or will it rise again to 245p Sept ’18 highs? Rising support since late January. 5 bounces, most recently at 220p today, to trade 222p (at time of writing). Will the pattern repeat, the shares climbing back towards 245p Sept ’18 highs? Shares -2% from 2019 highs; +17.7% from 2019 lows; +16.7% year-to-date. 4 Feb: Citi says Sainsbury/ASDA shop sell-off could allow Tesco to expand. Let’s say you like the Tesco chart and you think the price is heading back towards 245p again. You decide to buy exposure to £10,000 worth of Tesco using a CFD, at the current price of 222p. To do this, you need £2,000. Let’s assume Tesco rises back to 245p Sept ’18 highs (+10.3%). Your profit would be £1030, from your initial investment of £2,000. Conversely, let’s assume you open the above position, and place a stop-loss at 4% from the current price. Tesco falls 4% and hits your stop-loss. Your loss would be £400.